It’s no secret that sitting at your desk all day writing can be a strain on your body! I’ve learned over the years the right office chair can make all the difference in your level of comfort AND what helps you stay focused and in the mood to write! If you’re wondering what the best ergonomic office chairs might be for a writer, I’ve done A LOT of research into the subject! As someone who easily spends many hours in front of a laptop writing, I want to make sure I’m comfortable to ensure the best possible environment for focus and creativity. Posture-friendly office chairs have come a long way in development over the past several years – and if you haven’t upgraded your desk chair yet, 2018 is the year to take your writing space to the next level! I know what you might be thinking: It’s just a chair. Am I right? Well, as silly as it may seem – the right chair makes ALL the difference! One simple switch and she had less aches from a day of long hours. She was able to do her job better, and thousands of women are likely grateful that she was able to move from room to room quickly. The same applies to you as a writer. You will be a better writer when you are more comfortable. You will stay focused. You might just feel like a new person too! 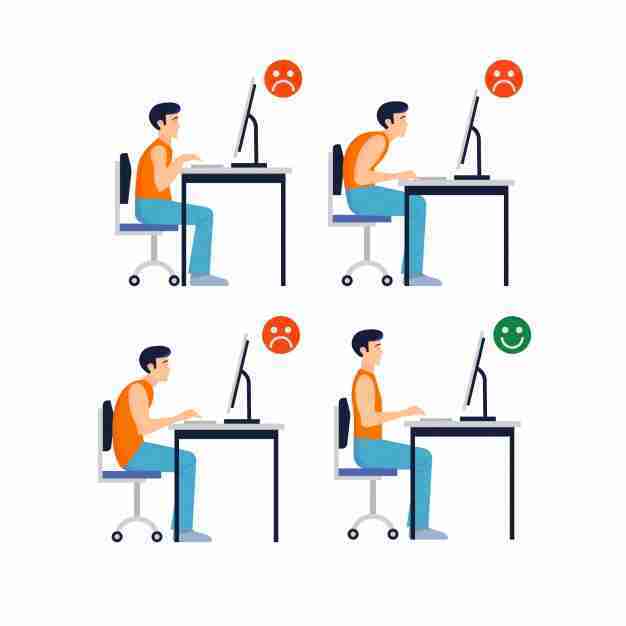 There are a lot of health risks to sitting at a desk all day – an ergonomically designed office chair for writing can help you get on a better path to wellness and make you a better writer. No longer will you be distracted by an uncomfortable sitting position or tempted to get up every 25 minutes! Believe it or not, there are actually recommended sitting positions for when you are sitting at your desk. Having a good office chair that accommodates your specific needs can make a big difference in your posture – and your overall health! As you can see, if a chair is too low or too high, it can cause you to slouch or strain your back, neck and shoulders. The right chair for you as a writer is one that helps support the best possible posture and customization for your body’s unique size and shape! An ergonomically designed chair will help ensure you write with the best posture possible! In researching and scouting out these office chairs, I took several factors into consideration, not just my own personal likes and needs. I’ve also heavily weighed the critical components many other professionals who spend a lot of time sitting at their desks have heavily requested and researched. PRICE: Let’s face it: not all of us have the budget to spend $2,000 on an office chair. Your posture and overall health as a writer should not depend on your income. We’ve done our best to choose office chairs that range in between $50 – $350. 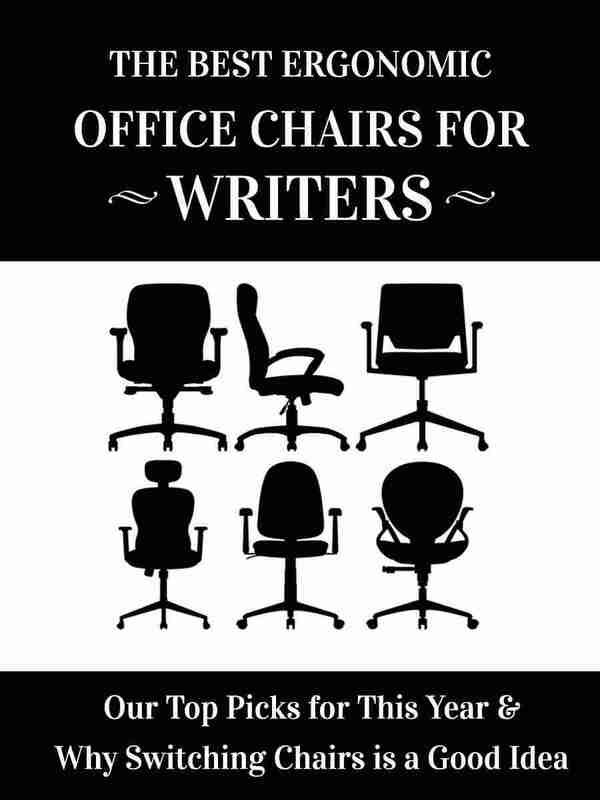 While there may be a few that go over this range, this helps make a comfortable writing chair for your home office an accessible option for most writers and professionals. DURABILITY: A chair is only as good as it lasts, right? If your office chair begins showing wear and tear after just a few months, you will likely be very disappointed. Ergonomic desk chairs come manufactured from a wide variety of materials, however everyone will have their own personal tastes and preferences on what materials will be most durable. For example, leather may be a great choice for some, but if you have pets it could be the perfect temptation to your cats claws! SIZE: While I’m sure most of us dream of having a giant room filled with books, a big desk, and ample space for a mammoth chair, the reality is many writers live in average sized homes. Massive chairs can be an option for some, but the majority of the work-at-home professionals we’ve talked to require something that is friendly on space so they do not feel too cramped at their desk. ONLINE AVAILABILITY: To ensure the products we feature in this round-up are accessible to most people, we’ve chosen items that are available from popular and trusted online vendors with return-friendly shipping policies. Being able to order online was a critical consideration for us, since many brick and mortar office supply stores can have unpredictable inventory. AVERAGE CONSUMER REVIEW: Like almost anything in life, just because I might love something, doesn’t mean other people will love it the same! In addition to gathering information from other writers and office professionals, I’ve taken into consideration of the average consumer reviews from around multiple internet sources to ensure the most unbiased opinions as possible. If you want to take your writing office space to a new level – and enjoy a much more comfortable and healthier writing environment, these ergonomic office chairs are all solid options to consider. Each of these ergonomically designed chairs offer a number of features and benefits that can help maximize your writing space. Noteable Features: Patented Kinemat tilt mechanism optimizes support for neck, back, ankles, shoulders thighs, and hips. Unique chair design allows for breathable air flow to keep you cool while working. Notable Features: Entry-level price, sleek modern design, active lumbar technology to pivot as you move, push-button adjustment controls. The Serta Back In Motion Office Chair is within a reasonable price range, which is just one of the many factors that pushed it into the top of our desk chair considerations for this list. This chair utilizes Active Seating Technology to allow for the chair to pivot and move in accordance with the person sitting in it for optimal lumbar support. Push button adjustment controls for the arm rests ensure optimal conditions for arm support. Serta is a leading manufacturer of comfort products worldwide, and has a number of offerings. If you need a larger chair or are interested in other options, you may want to check out the Serta Big and Tall Tranquility Executive Office Chair or the Serta 360 In Motion as possible alternatives in a reasonable price range. The Sleekform Ergonomic Kneeling Chair is unique in its design and offers many potential benefits for a low cost. If you look carefully at the design, you’ll notice one sitting on it extends their knees into the padded cushion at the base of the chair. This allows one to redistribute their weight while sitting from the hips and back muscles to maintain better posture. If you have never tried a kneeling chair before, it can take a few days to adjust to the different seating position, but it is ideal for those who normally might slouch in other office chairs. Kneeling chairs are also a popular option for teenagers and professionals who work long hours in an office environment. If the idea of a kneeling chair intrigues you, you may also wish to explore the Edge Ergonomic Kneeling Chair, as well as the Comfort Soft Kneeling Chair as potential candidates. Noteable Features: Memory Foam layering system for advanced comfort and firmness, weight capacity of 400 lbs, adjustable tilt and height. La-Z-Boy is no stranger to comfort, and the La-Z-Boy Delano Big & Tall Executive Office Chair offers a large luxurious style office chair. With layered memory foam cushions, this chair is designed to minimize discomfort from common pressure points. The waterfall design seat edge optimizes maximal body circulation while sitting, and convenient levers allow you to adjust as necessary to make accommodations for your own personal preferences. Another possible La-Z-Boy contender could be the similar but slightly smaller and more budget friendly LaZBoy Hyland Chair featuring Air Technology. Which Office Chair is Your Favorite? We’ve listed a lot of great choices to explore and consider as far as ergonomic office chairs go – now we want to hear from YOU. Which chair looks the most appealing to you? Do you have an office chair you love? How has it made a difference in your writing practice? Your thoughts and comments are always appreciated and welcomed below!